At the culmination of this series, a publication will be released featuring photo documentation, as well as previous and new texts exploring these relationships. 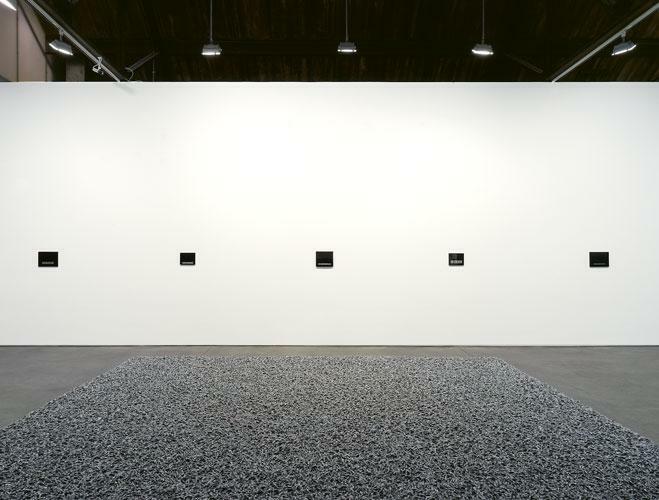 Felix Gonzalez-Torres: On thing I'm always very interested in dealing with is the notion of public and or private. The billboards can be shown in public. They're privately owned but always publicly shown. Joseph Kosuth: That's interesting. We probably don't know the details of each other's work, but my work from 1968, the beginning of The Second Investigation, was where I started doing anonymous advertising in public media. Through to 1979, I refused to sell anything. In particular, I didn't want those Investigations that were large installations to end up in somebody's home. I said, you can't buy it, but you can give me a grant like you give a scientist. And for this, I'll give you the right to put it in a public space. It couldn't be a private one, in a domestic space. The only collector I ever allowed to do that even temporarily was Giuseppe Panza, because the space he had was like a museum. He also promised to put my works in a public context eventually-which he is doing. But he was an exception. I got very little support for this work. I got support from the National Gallery in Canada and the Neue Gallery in Kassel which displayed a work for years on loan from a collector. But there were very few people who wanted to spend their money without getting some "goods", you know. FGT: Well, you opened the way for other artists. People can buy these billboards, but they have to put them in public-they have to rent a public space. It's like buying edition prints, except that you put them up on billboards. It's also doing a service to the collectors because they don't have to put the works into storage! JK: This goes from the earlier idea of the collector as someone who buys knickknacks to the idea of the collector as patron. It's a certain kind of leap that has more to do with intellectual engagement and less to do with reducing art to nice little things in the apartment. FGT: You know, someone once asked me to make an edition of prints. But I thought, why make an edition, why make a print? The world doesn't need any more prints by artists. So I said no. But then I thought about it and I said, well, why don't we push the limits and do a billboard? The conditions are such that you can only show it in public. You have to show it in public. JK: That's the thing. When you get an invitation which takes a certain traditional form, the point is not simply to reject it from some kind of moralistic "ivory tower" position. But rather to play with the form and its larger context so you end up turning it inside out. You make a cultural act and a political act out of the authority of the form that has always been there, unproblematic ally. That's the interesting material to work with. FGT: well, my first reaction was a very predictable leftist reaction which more and more I am questioning and finding very static and self-defeating. At this point I do not want to be outside the structure of power, I do not want to be the opposition, the alternative. Alternative to what: To power? No. I want to have power. It's effective in terms of change. I want to be like a virus that belongs to the institution. All the ideological apparatuses are, in other words, replicating themselves; because that's the way the culture works. So if I function as a virus, an imposter, an infiltrator, I will always replicate myself together with those institutions. And I think that maybe I'm embracing those institutions which before I would have rejected. Money and capitalism are powers that are here to stay, at least for the moment. It's within those structures that change can and will take place. My embrace is a strategy related to my initial rejection. FGT: At one time you had a point in rejecting them because there was no opportunity for genuine change within another socio-economic model. JK: Well, the point I was making was that in the 60's we were very much thinking about the fact that we really wanted to break the form of making meaning radically and we didn't want to show in galleries and museums. We wanted to work directly out in the world. And the work I did at that time reflected this. However, we began to realize that, in fact, there was already a discourse, a sort of circuitry of galleries and museums in which information could flow. Unplugging your microphone somehow didn't really seem to be the way to go. So when Leo Castelli asked me to show with him. In 1969, when I was 24 years old, It was the right crisis moment for that "truth". I realized that there were a lot of people who could not ignore the kind of work I was doing, which was becoming known as conceptual art, and that if I was in a gallery like Castelli, they had to take it seriously. So I went there. The space was often very loaded for me because of what had gone on it before. And that was often problematic. But that was part of the texture of what I had to work with. 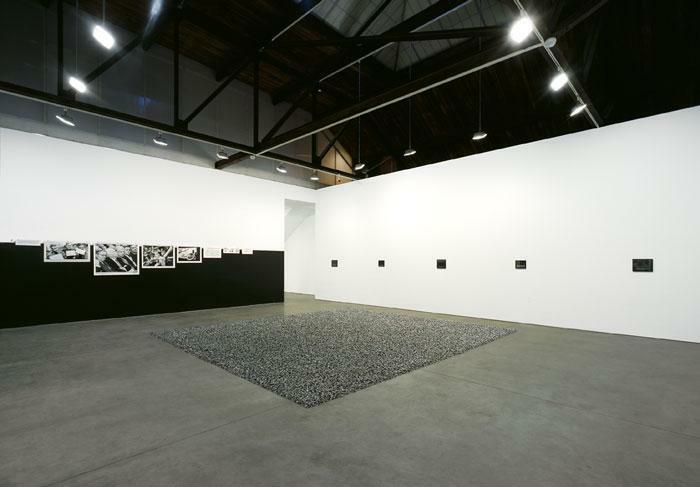 FGT: That space had a meaning, a kind of frame of reference in which the work was shown. I think that for you to have shown you work in a space like that is very crucial, very important, because as we know institutions have power and a very specific meaning, you can show in another space and not have the same effect that you had because you showed at Castelli. Also, when we think about the world, about showing out there in "the real world", we tend to forget that the galleries are also real. We tend to make a distinction between the inside and the outside. But sometimes, just because a work is "out there" doesn't make it public, you know. a work inside a gallery, in a so-called "private space", will sometimes be more public because it can relate to the public much more than anything that is outdoors. Some artists who do outdoor sculpture, they haul what is usually a large thing outside, into a place where people have no reference at all to this kind of thing. It's the difference between art in public and art for the public. FGT: Showing in a place like Castelli was important because that place already had a voice of authority within culture and the market. JK: Well, what we realize is that in this society, cultural engagement is expressed in economic terms. It wasn't simply about wanting to have money; it was an understanding that unless people could get engaged in your work, it would not have a cultural life. That really became very much part of the context of the material which one had to work with, that kind of struggle against the dynamic of the market, to fight for the meaning of your work in relation to what formed it. You know, you can sit in isolation and do "perfect" works, but until you're engaged with a community, the work really has no meaning. It needs to be in the world to have meaning. However the world seems to be constituted. Your perception of what the "world" is ultimately is what the work is. FGT: Well, it depends on how you define the world. For me, the world, my world, my public, was always just one person. You know. I've said that sometimes as a joke, sometimes seriously. For most of the work I do, I need the public to become responsible and to activate the work. Otherwise, it's just another kind of formalist exercise that looks very fitting the European sense, but not in America at this point in history. There's one question I wanted to ask you, about Ad Reinhardt. Sometimes it seems like two different styles of subject matter also. Well, in a sense, you put them side by side. It has almost a kind of formal quality. FGT: They are very similar. They're both, in their own area, extremely radical in terms of the artist and the artistic practice. Completely radical. You know, Reinhardt as a "painter" at that specific time in history, not only in art history but in that particular cultural moment. And with your work in the late 60's, which was a time in which America was going through a complete upheaval, a complete shift in morality and economics, and the Vietnam War was going on, suddenly you had an art work that people could not even depend on as something to hang on the wall. 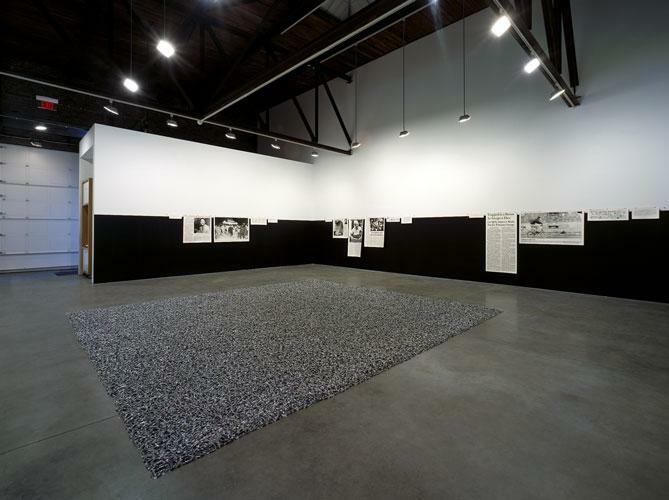 The work you were doing in 1968 refuses to look like art. Culture was changing so much; it was in such a state of upheaval, that one could not even count on the vital artistic drive to produce easily recognizable art work. You were dealing with a resemblance on the wall, which even today doesn't feel comfortable with the label of art. JK: Yes. It's surprising. 25 years later and my work still gets this reception. The use of photography, texts and just common objects is still in areas where people don't know its "pedigree". Art's life after decoration is a bumpy one…You know, I always had problems in getting museums to deal with common objects as common objects. The Museum of Modern Art, for example, is always putting a little podium underneath the chair in One and Three Chairs. It's only the thickness of a board, maybe an inch and a half height, but they wanted it to be clear that people –some tired art tourist-wouldn't sit in the chair. I've had people putting velvet ropes around these works and, with a work such as One and Five Clocks, one of which is in the Tate in London, I've had people making sure that the clock is really running and showing the right time. I wanted them understood as just common objects, as props to a proposition about art, and not, in fact, as having any kind of special auratic quality emanating from them. The relicry of Christendom continues to be applied to the desire mechanism of the modernist art market. That was a very difficult thing to rupture, those presumptions about art. The reasons for using photography at this point in the mid 60's was because of earth art, of artists bringing in photos from the desert , and other artist who, a couple of years later, by 1968, began using photography as the work. For me, this was becoming a new kind of paint. That's when I began to use public media. Anonymous works in magazines, newspapers, billboards, bus advertising and so on. I dropped handbills out of an airplane, I had 30 seconds on coast-to-coast Canadian television-you know all sorts of public media. There was no prejudice about that. And of course, I refused to sign the newspapers, to turn them into more traditional work. I simply collected them up, and finally, years later, there became a repository for them, still unsigned, at the Van Abbemuseum in Eindhoven. It was important for me to let one see the activity as something serious, not an expensive form of home decoration but as something that had its own validity. Something that could use the tradition of art which in some ways could be seen as conservative, but pull out of it something that could be meaningful in another way for those living at this end of the century. FGT: Well, I think that art gives us a voice. Whatever it is, whatever we want to make out of this thing called art. People generally complain about the art world. My students were complaining about it and said, well, there's no such thing as the art world. You can't go to a building down Broadway with a big sign outside saying "Art World". You can't knock on the door and say, "Hi, Art World. How are you doing?" There are different art worlds. It's not a monolithic structure. JK: Different art worlds that overlap. FGT: There are different institutions; in the same way that there are a lot of different artistic projects that we can use for our won ends. That's how I see art, as a possibility to have a voice. It's something vital. JK: I'm thinking of that in relation to Ad Reinhardt. You pointed out that you see the passage of those works within a history of the middle of this century. Perhaps it's about that period of transition from the original ideas of modernism that were formed through to where we are. He went through it, he was that passage, and the work really was a development of a voice of art as it was understood at that time, and in some ways, it could even look conservative. But what's interesting is that he took that "passage" with such severity and such single-mindedness that finally when you get to his important work, the black paintings, there is this incredible totalizing force. And by being so full, they appear to many as being empty, which is one of the delicious paradoxes of Reinhardt. And for me, as I've said, when you get to that "emptiness", the fullness of it is clear in all the other aspects of Reinhardt's signifying activity. In those cartoons, in his teaching, in all the panel discussions that he participated in, in those incredible slide shows, in his writing. I mean, all that history makes one realize the important responsibility of the artist, the moral agency of the artist. And this, for me, was important and taught me much as a young artist. Artists have a special responsibility. Our activity must make a difference. As Reinhardt said, "art is not the spiritual side of business." This is central to a shift from the artist being a decorator concerned with forms and colors to being a cultural activist concerned with meaning. Reinhardt's total signifying activity was my source to identify the need for this shift. There's a difference between what artists do, and there has to be that kind of moral agency behind the activity of the artist. Without it being simply moralistic, however, at the same time. We have to, as a practice, mean something. This is always a political act. FGT: I'd like to return to what we were talking about before, that art is like an antenna of what's going on in culture, what's really going on and what's going to come out of it. After those years of conceptual art that demanded so much from the viewer, so much a participation, so much of an intellectual involvement, we had a return in the 80's to the expensive home decorations, you know? Big paintings to fill those now empty office spaces downtown. That was a very scary time for me, because I saw this as a very ahistoric artistic practice. JK: It was depressing to see after so many years of fighting against that. FGT: It was as if we had no collective memory, no past. JK: Exactly. It's complete elimination. FGT: It was like this celebration…It was too scary to be funny. JK: It was an ahisotrical parading of history-as tradition-for the market. FGT: Sure. It renounced any kind of history, any kind of involvement, any kind of judgment involvement with the work. It was just a massive excessive production of splatters of paint that meant nothing. But in a way this excessive gesture devoured itself, it proved how empty it was by its own default. JK: It only cited artistic forms that could function as an authority, an authority that would function in the market as quality. In other words, it was only the skin; it had not the heart of it. FGT: Well, it was not like Reinhardt's painting in which there's an intellectual demand on the viewer about accepting and engaging this painting that's just black on black. And you even need a few minutes to see that the blacks in the painting are different. It's very different to what was requested from the viewer with those huge paintings with a lot of splattered color and tacky figures doing something in the East Village, gentrifying this neighborhood and doing paintings late at night. Wow, how Bohemian. JK: Wearing expensive suits…Dress like a yuppie and paint like Pollock. JK: But that was the only thing that could be shocking, that you could paint in a Versace suit. The element of the avant-garde shocking the middle class-the art couldn't do it anymore. They had to wear the suit to do it, the last icon to break. JK: They needed a meaningful social context in which they could use that money. FGT: It became the spiritual side of business. (laughter) But what a spirit! I mean, again, it reflected what was happening in business. The junk bond days and the Savings and Loans feast - I don't even have words to describe that, because it's what we're paying for right now. You might not know this, but right now we're no longer a welfare state, because in America for every dollar we spend on welfare, we spend six dollars to bail out the Savings and Loans. JK: Which was basically gutted by the coterie around the past 12 years of Republican administration. FGT: Right. The Republicans were going to eliminate the deficit, and they tripled it. They changed the priorities of our economy and our society. Take their military complex. In 1980, for every dollar we spent on housing, we spent six dollars on the military. In 1989 for every dollar we spent on housing, we were spending 31 dollars on the military. So no wonder after 12 years of this, artists are going to become the final threat. Cultural production is their final frontier. They have already changed the economics of this country. So what do they want to do now? They want to have a clean culture that reflects the ideal, you know, American family values, whatever those might be. At the same time, we have to recognize that there was also a lot of very valuable artistic practice happening in the 80's, mostly by women, within the feminist camp. JK: Absolutely. When you had the Schnabel and Lupertz type of artists doing these incredible, big "Expressions", these phallocentric productions, the perfect antidote, the perfect alternative was being made by a group of women. This existed also in Europe, but it was much stronger in New York. It was just the best work that was being done. FGT: I think history will take care of that, hopefully. JK: Those processes have already, I think, very much relativised that production. Because it essential got its meaning from the market. And the market does that, there's no meaning left to put it simply. It was funny that when there was an oil glut in the market, there was an oil glut in the art world as well. You know, most of my life, we never knew what our colleagues were selling for. We were almost embarrassed to even know. It's something I would never even have asked. I remember one day at the gallery one of the people working there was just amazed that the new younger artists who came in could quote each other's prices. JK: It was a horse race, and that was how you could tell whether you were winning or not. It was hard to tell from the work. FGT: It's funny that at that time, in the 80's, if these people didn't sell out their shows at the openings, their careers were going downhill! The master narrative in full color. I was just thinking about the recent television program on art on 60 Minutes. JK: It was very stupid. Completely ignorant. You know for years, whenever I was flying somewhere; I would read Time or Newsweek. I would never read the art because it was terrible, they didn't know what they were talking about in most cases, but I would read the science or other things, you know, really read it. After a certain point I said to myself, wait a minute, if they're idiots about the one topic I know well, then they're probably the same with all the other topics. FGT: Well the 60 Minutes program was, in a way, very gratifying to me because it was so extremely 50's – it deconstructed and parodied itself. What's art and what isn't? Come on! Give me a break. At this point, to ask those questions is so sad. Everything happens in culture because it is needed. 60 Minutes makes a program in 1993 about certain of these recent artistic productions that question the market and criticize it, but they never made a program criticizing the retro-practice of the "heroic" painters of the 80's. FGT: But also, Joseph, the art they decided to criticize, the art they decided to portray, is art that pushes the limits. I mean Koons' art, whether you like it or not, is a parody of itself. A parody of the economic crimes and excesses of the go-go 80's. It was an artistic production that was necessary and meaningful. JK: And it's interesting when those limits are identified with artistic ones. But still, it's a limit. And it makes people nervous when art deals with this. FGT: I wonder how much more comfortable they would have been with painting than with what were mostly objects. JK: Well, apparently even Ryman was radical. Ryman, I mean, is the darling of middle-class academics who function now as the most conservative critics – neo- formalist theorists like Thierry de Duve or Yve-Alain Bois. Whatever Ryman meant in the 60's, is not what he means now (and we can fairly ask whether or not it's the artist's fault). This is something that one has to take into account. But anyway, on this program a Ryman was seen as an empty painting. FGT: But still, I think that's the beauty of it. JK: Which is where Reinhardt is, for me, worth much more. He did "empty" paintings too, but the difference is what else he did. Unlike Ryman, he didn't passively let the critics create the meaning of his work. Reinhardt was radical. FGT: Still, we feel very uncomfortable with the label of art, you know, like most of your stuff…and I think its pretty…that , for me, is beauty. FGT: That within this so-called art, we are expected to fulfill certain roles, to produce certain objects with very specific qualities. We still reject those notions and can produce a whole body of work, objects that don't follow those restrictions. And, for me, that is the beauty of this kind of…I don't even know what we can call it, radical practice. JK: yes, it's difficult. But what else? FGT: Reinhardt is a very specific voice, a very special voice. Very unique, and in a way, very effective. The book you have of Reinhardt's, when he showed at the Jewish Museum, I was very impressed by the biography, how he mixed historical events with his life. I've never seen that so thoroughly done. That touches me because I believe social, political and historical issues should be part of the "studio", the same way that these issues shape who we are. JK: I remember standing at the opening, looking at that and thinking, what a brilliant thing to do. It was considered a very, you know, wild thing to do at the time. I remember everyone was thinking, how come he's bringing all this stuff into his biography? FGT: The last 30 years, with psychoanalysis and Marxist analysis and feminism more than anything else, studying how subjectivity functions, this division between private and public becomes very questionable. JK: You've dealt with that so well in your work. FGT: Some of the works I've been doing for the last few years have been portraits in which I asked a person to give me a list of events in their lives, private events, and then mix those up with public events, more or less relating the public to these so- called private events. At this point in history, how can we talk about private events? Or private moments? When we have television and phones inside our homes, when our bodies have been legislated by the state? We can perhaps only talk about private property. It was very revealing for me to see how Reinhardt included the independence of India in his biography. Because such things affect who we are in private- our most private practices and desires are ruled by, affected by the public, by history. JK: What I was referring to was how the younger neo formalist critics are distorting, well, really missing the point. They look at Reinhardt's black paintings and they don't realize that the biography you're talking about is as much about Reinhardt as those black paintings. You can't separate the two. The man who had that as his biography in his retrospective in 1966 is the same man who made the black paintings. The problem with the critics I'm referring to is that they don't see the total signifying production as one large work. They look only at those nominate "art works" because that's what the market recognizes as the production. They're still leaning on the market to provide the meaning for the activity. But we, as artists, understand that its on large process, that you can't somehow prioritize specific, given forms in that way. They inform each other. "A Reinhardt J Kosuth F Gonzalez Torres"